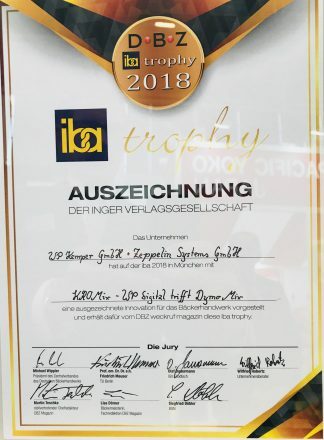 We’re delighted to announce that in conjunction with WP Kemper, we have been awarded the IBA trophy for our joint project combining the DymoMix with Kemper’s KRONOS spiral mixer. Presented by DBZ Wakeup Magazine, the award recognises innovative new developments or significant improvements to proven machines, and systems supporting and promoting the bakery trade. We were awarded the IBA Trophy for working with WP Kemper to optimise the mixing batch process in a sustainable way. By combining the mixers, DymoMix and Kronos, this allowed mixing times to be shortened and the quality of dough (compared to conventional batch mixing processes) to be improved at the same time. With our competences, Zeppelin Systems and WP Kemper can now cover the whole process, from material handling to dough processing. Our new-process engineering innovations mean that Zeppelin technology now has better performance, lower operating costs and, more than ever: increases the efficiency of your plant. For more information on any of our systems, please call us on +44 7970 235 029 or email david.scott@zeppelin-uk.com.